My name is Holly I am the new Phonics Stars™ class leader for the Dulwich & Forest Hill and Chislehurst & Bromley areas. 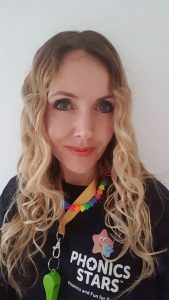 I am a qualified specialist teaching practitioner, with many years experience teaching and supporting Primary School children with Dyslexia in both Private and State schools. As a dyslexia specialist, I usually work with children who are behind expected levels. I work with those who are not secure in their knowledge of the letters and corresponding sounds, even at ages 5, 6 and 7 years. It was clear to me that children who had attended Phonics Stars™ would be at a significant advantage over their peers in terms of their phonetic awareness and reading development. I was so impressed at the ability of children at Sam’s Phonics Stars™ classes that I just had to get involved to help Sam share these fun and educational classes to a wider audience. Phonics Stars™️ promote ‘learning through play’ to support the wider early years developmental skills including fine and gross motor skills, crossing the mid-line, working with others in a group, following simple instructions and developing an awareness of positional language – all of which is developed in a fun and engaging way. Contact Holly via Email holly.ewerse@phonicsstars.co.uk or via her Facebook Page.